The HCC Women's Soccer team is proud to host the 2nd Annual Futsal Tournament this winter at the Athletic, Recreation & Community Center (ARCC) on the Hagerstown campus. The funds raised will benefit women's soccer athletic scholarships to HCC. Entry fee per each 12 player team is $150, with 3 games guaranteed. Officials will be provided. <Click here> to enter your team. You will receive an email confrimation, and your team tournament spot will be held pending receipt of your entry fee. 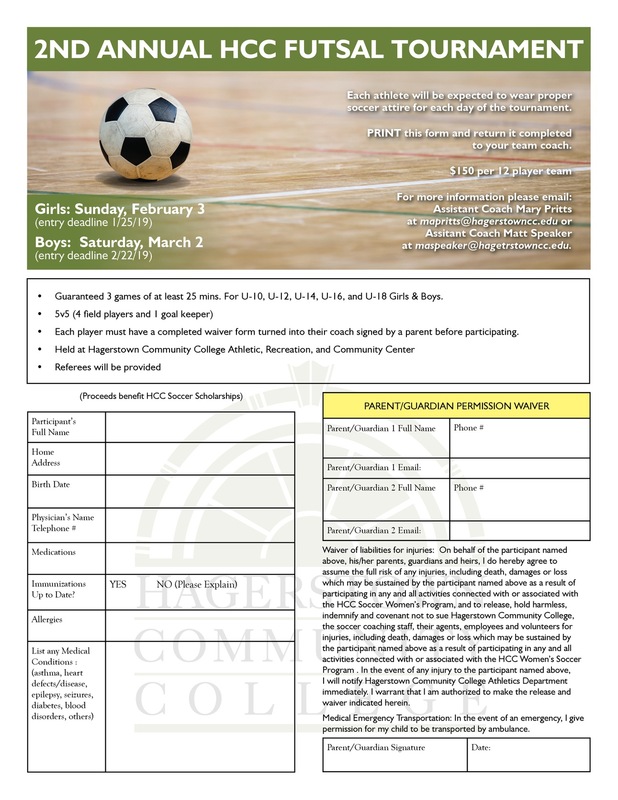 Every player must have a completed Futsal Player Waiver Form <click here> signed by a parent/guardian. No player will be admitted to play without a waiver on tournament day. Coaches must collect and present player waivers at check in on tournament day.